Easter Lily looked over her left petals and she saw a few monarch butterflies fly past her. They were absolutely beautiful. “I suppose that after being asleep all winter that it is nice to wake up to colour,” said Renee. “It definitely is,” said Easter Lily. Renee saw a baby bunny hopping through the garden. “What a beautiful sight,” said Renee, whispering so as not to scare the baby bunny away. Easter Lily stood up straight and shook the dirt off her feet. She slowly walked toward the oak tree. She stumbled a few times but the more she walked the stronger her legs were. The man got up off the bench and walked away. “Good job,” said Renee, landing in the oak tree above Easter Lily’s head. The next morning, the man came back to the oak tree to talk to Easter Lily. Sometimes it is best to take to others about our problems. 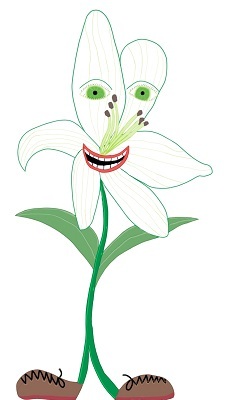 Example: After talking to Easter Lily, the man felt better. This entry was posted in Easter Lily Stories, Easter Stories, Grade 3 Level and tagged best, chickadee, Easter, Easter Lily, flowers, friend, garden, monarch butterflies, Renee, Renee Chickadee, waking up. Bookmark the permalink.